Release Date: June 8th, 2007 by Columbia Pictures. The Voices: Shia LaBeouf, Jon Heder, James Woods, Zooey Deschanel, Jeff Bridges, Diedrich Bader. Directed by Ash Brannon and Chris Buck. 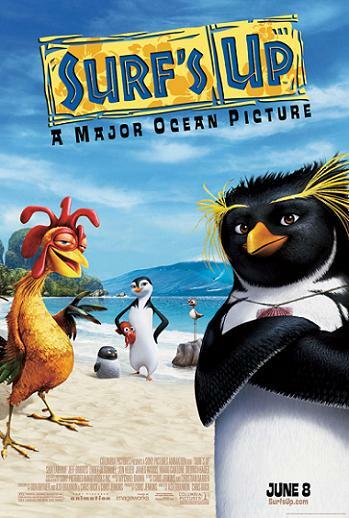 BASIC PREMISE: Cory (voice of LaBeouf), a 17-year-old penguin from Shiverpool, Antarctica, competes in Big Z’s Memorial Surf Off while a documentary film crew follows him around. ENTERTAINMENT VALUE: Surf’s Up has beautiful CGI animation, but suffers from the same symptoms as Shrek the Third: it has a mostly dull plot low on laughs. Cody leaves his family in Shiverpool to a tropical island and competes in Big Z’s Memorial Surf Off, where his biggest rival is Tank Evans (voice of Bader). He runs into a washed-up Big Z (voice of Bridges) who becomes his mentor through the competition. Of course, Cody meets a female penguin, Lani (voice of Deschanel) who roots for him. Unfortunately, none of the characters are lively enough, even an air-headed chicken (voice of Heder) who also surfs. The screenplay, written by four writers, lacks witty dialogue and much of the attempts at visual humor fall flat, like when Cody and Lani end up in poo that glows. Most of the plot feels like a dull drama that often drags and only comes to life when the birds surf. Co-directors Ash Brannon and Chris Buck occasionally use a mockumentary style which adds a little panache, but doesn’t help much in terms of adding much-needed humor except when someone asks a penguin if he can sing and dance—an obvious reference to Happy Feet. On a positive note, the directors provide plenty of eye candy with the brilliant CGI animation, especially the waves which look very awe-inspiring. Be sure to stay through the end credits for an additional scene. INSULT TO YOUR INTELLIGENCE: Often dull and not enough laughs. IN A NUTSHELL: Brilliant CGI animation, but a mostly weak, unimaginative plot without enough laughs.